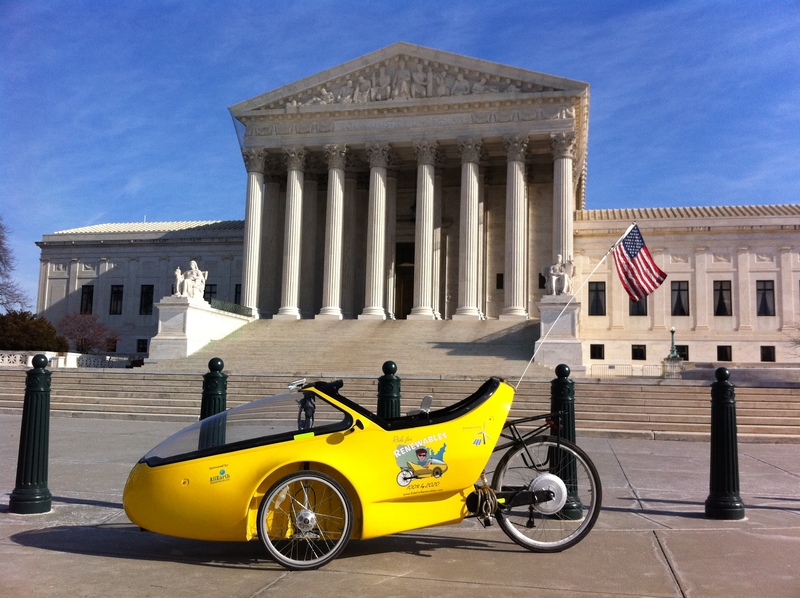 I didn’t think I’d be in Washington, DC seven weeks after the conclusion of the ride, but nothing happens quickly in this city. If you want to make an impact, you have to stick around and seize opportunities as they present themselves – something to consider as we gear up to protect our childrens’ futures in the nation’s capital. “Lobby days” and “lobby weeks” are simply no match for the legions of K Street lobbyists swarming the halls of Congress round-the-clock. 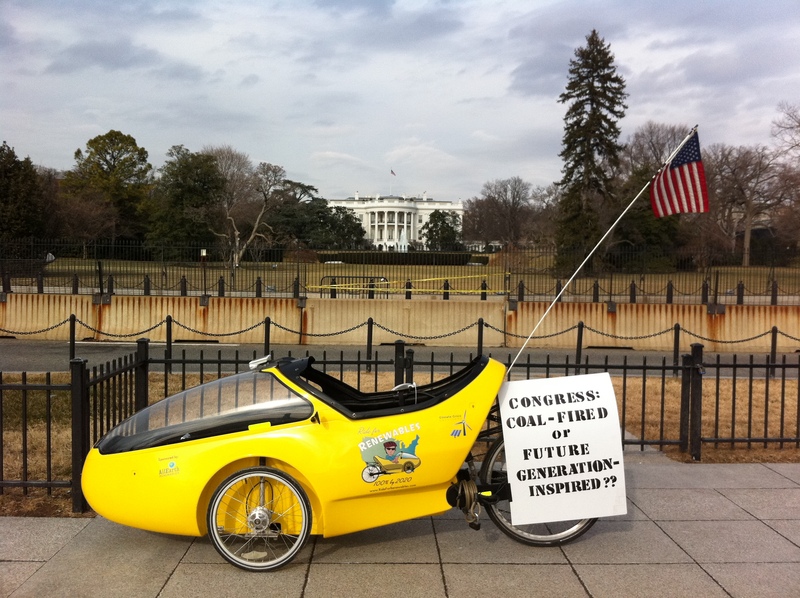 It will take an army of determined citizen activists responding in kind to bring some climate sanity to what NASA scientist James Hansen colorfully describes as a “well-oiled” and “coal-fired” Congress. 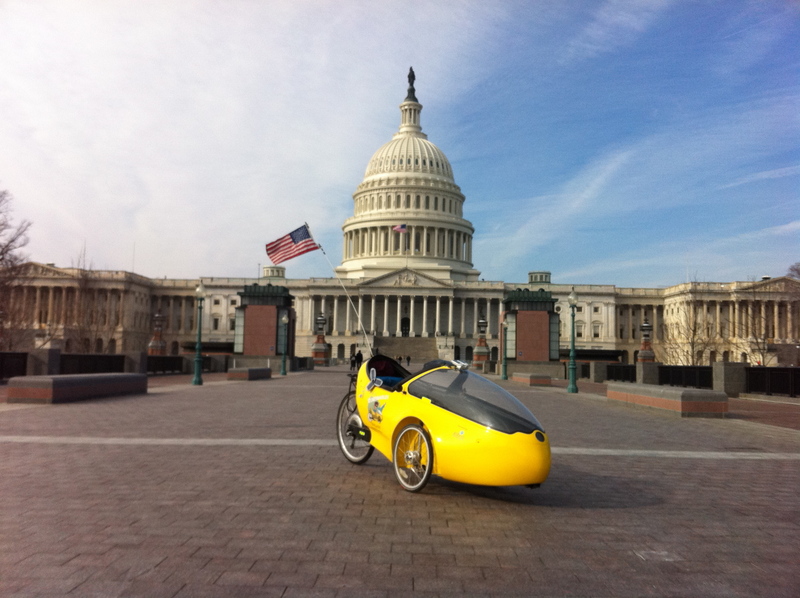 Having not succeeded (yet) in getting a face-to-face meeting with the President and First Lady, I eventually settled for faxing the “100% by 2020” petition – with the names, cities and states of those who signed it – to the White House. For good measure, I hand-delivered a copy to the White House’s office of Council on Environmental Quality. I also personally delivered copies of the petition to the offices of Senate Majority Leader Mitch McConnell; Senate Minority Leader Harry Reid; House Speaker John Boehner; and House Democratic Leader Nancy Pelosi. They have been put on notice – more than 40 states were represented on the petition. I want to extend a very special thanks to everyone who signed it!! But I hadn’t pedaled 2,400 miles across America’s heartland to leave things at that. More had to be done. I just hadn’t quite figured out exactly what yet. Then I saw an article in The Washington Post announcing Chinese President Hu Jintao’s upcoming visit to the White House for a state dinner. It was the opening I was looking for. The plan came together a few days prior to his visit over a series of phone conversations with my good and great friend, Paul Alexander. We weren’t about to let this moment pass – the presidents of the world’s two largest greenhouse gas emitting nations meeting together at the White House – without demanding some accountability. Working closely with Lester Brown, I drafted an open letter calling on Presidents Obama and Hu to place the global climate emergency at the top of their policy agendas. The letter also called on both leaders to embrace a goal of reducing carbon emissions to 350 parts per million (the level top climate scientists say is safe for humanity) by committing to 80% carbon cuts by 2020. By now, we were only two days out from Hu’s arrival, so I emailed the letter to some key allies, asking for a sign-on response within 48 hours. The protesters I had anticipated were there, just not in the numbers I had expected. 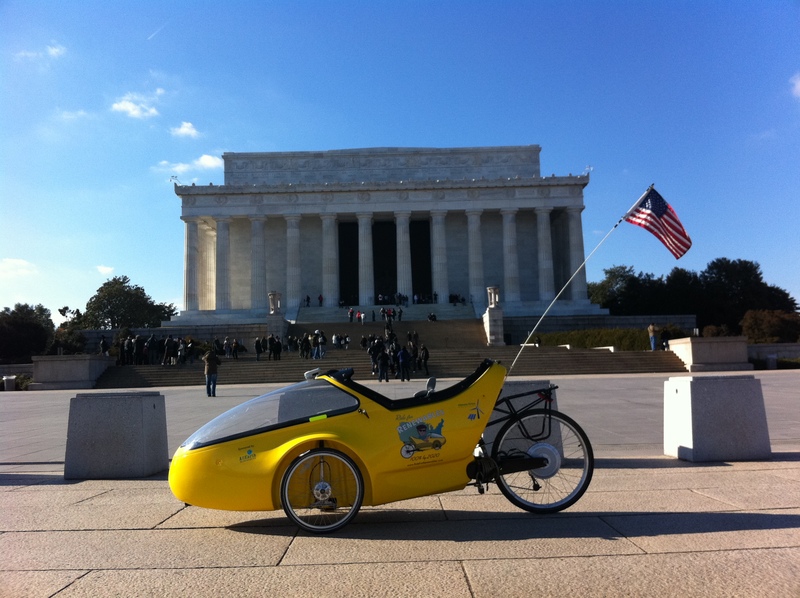 And White House security officials I spoke to indicated I would be able to bring the trike to Lafayette Park (directly across Pennsylvania Avenue from the White House). 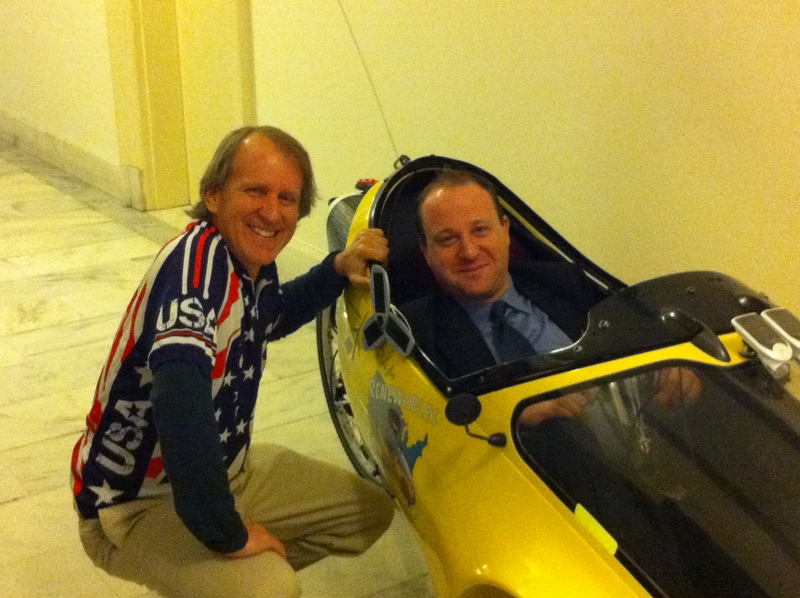 Satisfied, I pedaled back to Capitol Hill to make some final recruitment calls and send a press advisory out to my media contacts. By the time I had shut down my computer for the night, nearly two dozen prominent environmental, business and religious leaders – including the head of the Sierra Club – had signed onto the open letter. Never in the history of the environmental movement had so many major organizations gone on record calling for 80% carbon cuts (based on 2006 levels) by 2020. It was an unprecedented display of climate leadership. A new line had been drawn in the sand. 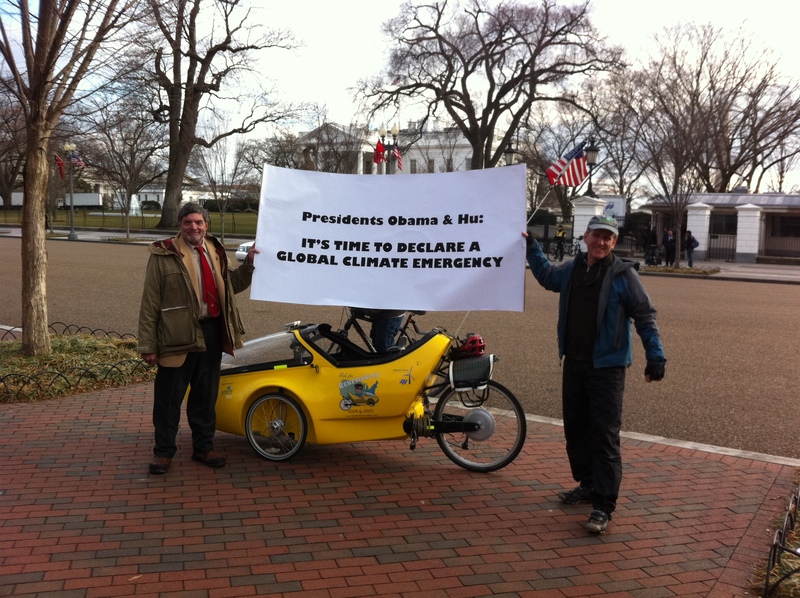 The following morning, I rolled over to Kinko’s to pick up the banner I had ordered the night before, which read: “Presidents Obama & Hu: It’s Time to Declare a Global Climate Emergency.” After faxing the open letter to the White House from there, I pedaled from Capitol Hill down Pennsylvania Avenue to the White House. Armed with copies of the letter for the media, I held a 5-hour vigil outside the White House gates. Joining me over the course of the afternoon to lend their moral support were two deans of the U.S. environmental movement, Brent Blackwelder and Brock Evans. Their presence was deeply appreciated. True to form, no DC media outlets covered the event or the release of the open letter, but it did get picked up on some blogs and websites, just not enough to give the story “legs.” With no word that other groups had sent it to their media lists, I felt compelled to drop another $300 for a national media distribution. As luck would have it, Environmental News Service, which also has a news arm, was looking for an environmental hook for their story on the Obama-Hu meeting, which the open letter conveniently provided. Between this, and Paul Alexander personally forwarding the open letter to many hundreds of media, environmental, energy and other organizations, blogs and leaders in the coming days, the story got picked up on hundreds of websites worldwide and has taken on a life of its own. That is the true power of the internet. We can’t always break through to the traditional media, but we can create our own media. It is time to publicly acknowledge that the continued burning of fossil fuels threatens the survival of civilization. The science is incontrovertible on this fact, yet the response from government is business as usual. Our two nations dominate world carbon emissions. No civilization has survived the ongoing destruction of its natural support systems, nor will ours. It is with a deepening sense of dread over the fate of future generations that we call on you to acknowledge the severity of the global climate emergency by placing climate stabilization at the top of your policy agendas. This is just the beginning. Nature tells us time is running out, but we can’t see the clock. As we blindly reach critical climate “tipping points,” things promise to get worse, much worse. Central to the solution is a wartime-like mobilization by the governments of the United States and China to cut carbon emissions 80 percent (based on 2006 levels) by 2020. This is required if we are to reduce carbon emissions to 350 parts per million in the atmosphere, the level top climate scientists say is safe for humanity. There is no more important measure of presidential leadership than living up to the expectations of our children to protect their future. Every day our respective governments fail to act, their future grows more perilous. We await your response. David Blittersdorf, President/CEO, AllEarth Renewables, Inc.
Jan Blittersdorf, President/CEO, NRG Systems, Inc.
**My apologies for any confusion: the American Wind Energy Association does not support the views expressed in this letter. 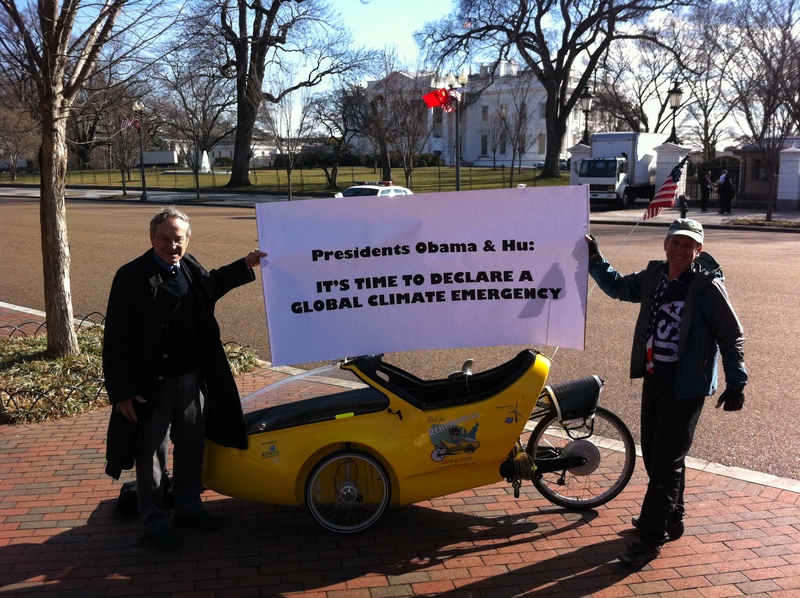 The January 19 open letter to Presidents Obama & Hu marks a new chapter in the history of the planetary protection movement. Never before have environmental groups as diverse as the Sierra Club, Earth Policy Institute, Greenpeace, Center for Biological Diversity, 350.org and the Endangered Species Coalition joined forces with businesses and religious leaders to call for a “wartime-like mobilization” to stabilize the Earth’s deteriorating climate. It is worth noting that the final sentence in the letter to both presidents was: “We await your response.” But you know that President Obama is really awaiting ours, to see how serious we are. I’ll never forget how struck I was by the words of a climate skeptic a few years back. They read something like this: “I’ll believe it’s a crisis when the people who keep calling it a crisis start acting like it’s a crisis.” How profound, and true. 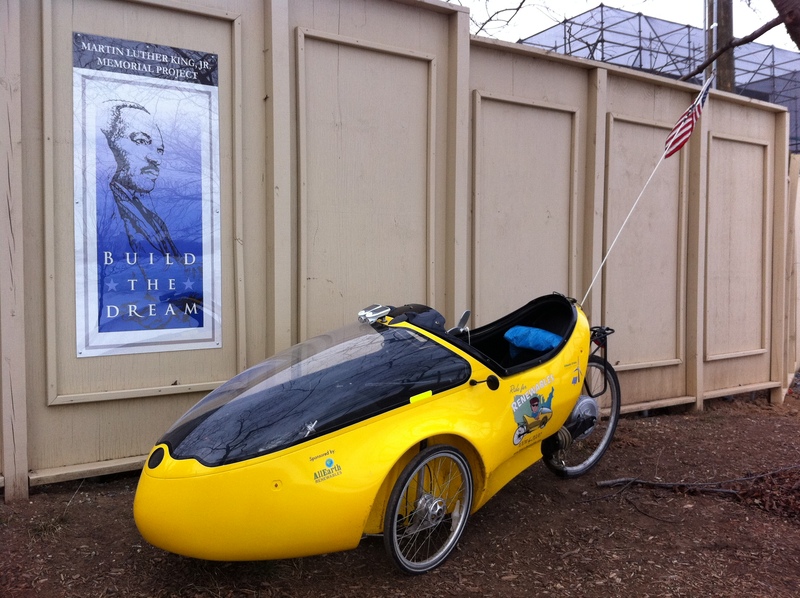 Later I read in The Washington Post that the memorial to honor Dr. Martin Luther King, Jr., long in the planning, was finally nearing completion, so one afternoon I pedaled my trike down to the Tidal Basin to see what I could. The statue itself is shrouded, as the sculptor applies the finishing touches, but the memorial site is coming together beautifully. It will be officially unveiled this summer on the anniversary of Dr. King’s historic “I Have A Dream” speech. What a glorious day that will be! I just wish I could be there, as no one has inspired my life more than Martin Luther King, Jr. It’s not just what he achieved during his brief time on this planet that inspires me, but how he fearlessly achieved it. The words that he spoke in 1964, upon receiving the Nobel Peace Prize, could just as easily apply to the global climate crisis we’re facing today: “Here and there an individual or group… rises to the majestic heights of moral maturity. So in a real sense this is a great time to be alive… Granted that the easygoing optimism of yesterday is impossible… Granted that we face a world crisis… But every crisis has both its dangers and its opportunities. It can spell either salvation or doom…” Our future clearly hinges on finding the “moral maturity” Dr. King saw from the mountaintop. And then there is one who does not have a statue in Washington, DC, but should: the late, great David Brower. No one in the environmental movement has influenced me more than this man, who was nominated for the Nobel Peace Prize three times for his tireless efforts to protect the planet. David helped define the contemporary environmental movement through the groups he founded, and by the principled philosophy he embraced: “We are to hold fast to what we believe is right, fight for it, and find allies and adduce all possible arguments for our cause. If we cannot find enough vigor in us or them to win, then let someone else propose the compromise.” I had the good fortune of befriending David during the final years of his life. Despite battling cancer, he was eager to join me in my quest to inject a sense of environmental urgency into the 2000 presidential primary campaign. He rallied his frail body to travel in the dead of winter to the early caucus and primary states of Iowa and New Hampshire, respectively, for a series of campaign rallies and events. He fought to the very end of his life, which was illuminated by a Goethe quote he lived by:“Whatever you can do, or dream you can, begin it. Boldness has genius, power, and magic in it.” It was the daily reminder of this quote on my office wall, more than anything else, that prompted me to launch this ride. I asked myself more than once during the ride what David would do if he were alive today. 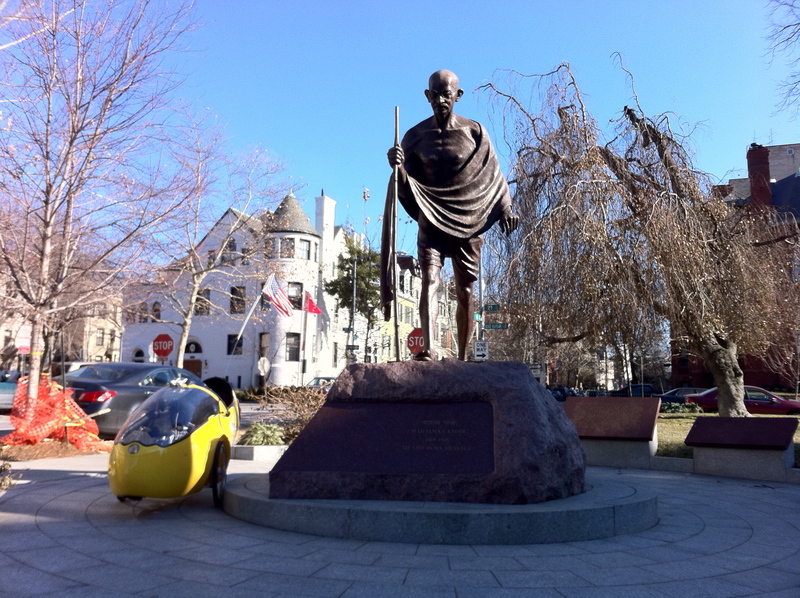 Someday, he will be properly honored in our nation’s capitol. 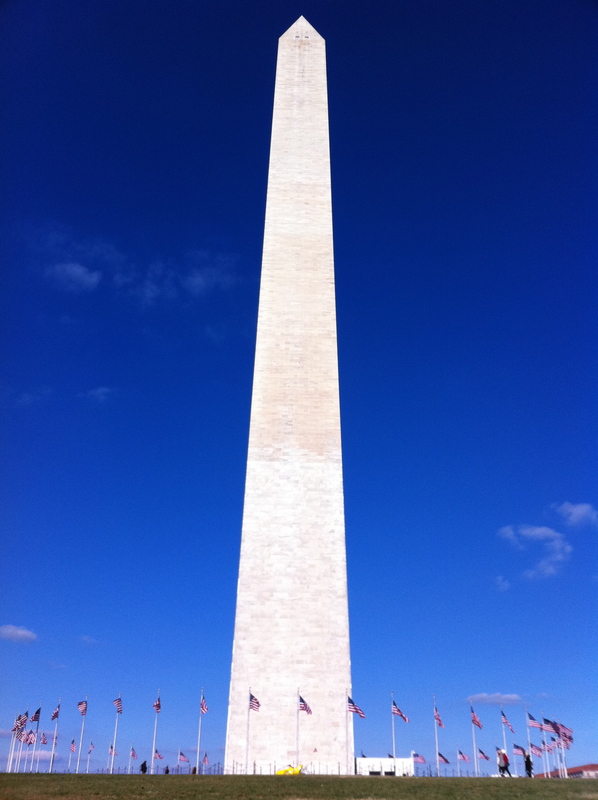 Of course, no trip to Washington, DC would be complete without a visit to the Lincoln Memorial and Washington Monument. And while it lost much of its luster for me after the 2000 election debacle, there’s also the Supreme Court.